A fast moving, minimally penetrating 45 auto round that is ideally suited for concealed carry work or for in-home defensive shooting where you need to ensure no overpenetration or second target penetration, especially through walls. 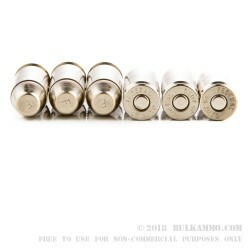 The expansion of the projectile is all but guaranteed with the internal polymer mechanism that swages the outer alloy enclosure to push the center out as the front of the bullet makes an impact. This is a serious solution to a legitimate problem, that probably doesn’t get enough attention. 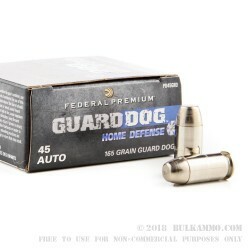 Federal offers a reliable, hard hitting, but non-risky personal defense option for those who carry the .45 ACP and need a speedy, top quality defensive round. It will penetrate 7-10” generally, in ballistic gelatin testing and offers 1140 feet per second velocity out of the muzzle and 476 ft. lbs. of energy. 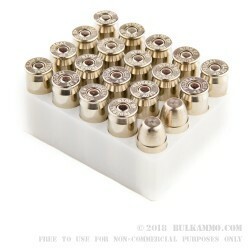 This is a substantial load that has the potential to stop a threat as well as any other .45 ACP, without some of the potential negative aspects of a heavier penetrating projectile. 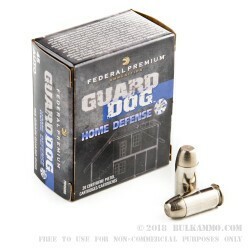 Federal offers some of the best production finishes and quality of manufacturing out of all of the large producers, and the reliability and consistency of the Guard Dog line proves this. This is my everyday self defense carry ammo. It works flawlessly in all my .45's, some of which don't like JHP very much. Cost is in the ballpark with other self defense ammo.